Malani K*, Jagtap S**, Swaminathan G**, Samant PY***. Cesarean myomectomy has been conventionally discouraged in view of possibility of uncontrollable hemorrhage and maternal morbidity. However, it is recently becoming popular with some researchers concluding that it is safe. We present a case of an unavoidable caesarean myomectomy with uneventful post-operative course. From the time of Victor Bonney, cesarean myomectomy was strongly discouraged for the torrential blood loss it may cause. But in the last 20 years, numerous case reports and case control studies have supported cesarean myomectomy as safe and even cost effective. Nevertheless, some authors suspect that complications are under reported. A case of cesarean myomectomy is presented here. Twenty nine year old Gravida 3 Para 1 Abortion 1 Living 1 with a previous cesarean section was diagnosed with an uterine intramural fundal fibroid of 5.7 x 4.5 x 5 cm in the first trimester. The diagnosis was reconfirmed in second trimester with no significant change in size. She had an uneventful antenatal period. Most of this time, she was following up in a primary centre. She had been diagnosed of hypothyroidism since 2 years and was on thyroid supplements. She was detected with gestational diabetes mellitus in the current pregnancy and was controlled on medical nutrition therapy. She was compliant with medications and diet. In view of cephalopelvic disproportion, she was advised elective lower segment caesarean section at 38 weeks, but did not get admitted. She came to emergency room in early labor and was prepared for immediate cesarean section. Her hemoglobin was normal and blood was cross matched and kept ready. Intraoperatively, fibroid was not palpable. Baby’s head was deflexed. After delivery of the baby and placenta, an 8 x 8 x 4 cm intramural fibroid was seen protruding from the upper edge of the uterine incision (figure 1). This location of fibroid was least expected since antenatal ultrasonographic scans were suggestive of fundal fibroid. 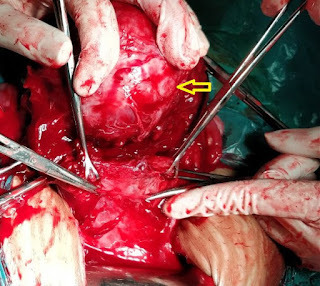 After careful examination of the fibroid size and position, decision of caesarean myomectomy was made, which if not done would make closure of uterine incision impossible. Required consent was sought and documented. Blunt and sharp dissection was done to free the myoma of its pseudocapsule. (Figure 2) Myoma specimen was of salmon pink colour and non hemorrhagic and sent for histopathological examination. Multiple figure of eight interrupted sutures were taken with no. 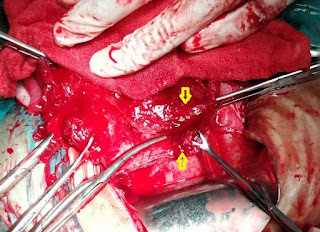 1 delayed absorbable sutures in the myoma bed and hemostasis was achieved. After this, it was possible for closure for the uterine incision with no difficulty. (Figure 3) Uterine incision closure was performed in single layer with continuous interlocking sutures. Injection tranexamic acid 1 gram intravenous infusion was started intraoperatively and oxytocin infusion was continued for 6 hours post-delivery. Post-operative recovery was uneventful. In view of estimated blood loss of around 1200 ml, she was transfused one unit of packed red cells post operatively. Hemoglobin done on third post-operative day was 8.6 gm %, and was discharged on oral iron. There were no wound complications. Figure 1. 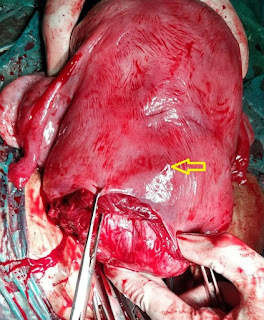 Arrow pointing to intramural fibroid in lower uterine segment, just above uterine incision. Figure 2. Arrow pointing to fibroid being removed. Figure 3. Uterine incision after removal of fibroid, with arrows pointing to the upper and lower parts of the incisions. Uterine fibroids are seen in 0.3 to 3 % pregnancies. They are associated with complications like intra uterine growth restriction, fetal malpresentations, premature rupture of membranes, preterm delivery, obstructed labor, retained placenta, severe pain in case of red degeneration and in rare cases; placental abruption due to location under the placental site. Antepartum management is essentially conservative, but for extreme reasons, antepartum myomectomy has been reported. Obvious reasons of avoiding excision of fibroid at time of cesarean section are high chances of torrential hemorrhage, atonic uterus and resultant hysterectomy. But sometimes, cesarean myomectomy becomes unavoidable like in case of fibroids in the lower uterine segment posing difficulty in baby delivery or uterine closure. In our case, there was difficulty in closure of uterine incision, which necessitated myomectomy. A study comparing uterine artery embolization followed by cesarean myomectomy with only cesarean section showed that short and long term results were comparable. The average blood loss in one study ranged between 200 to 1000 ml with an average of around 500 ml. Based on a large retrospective case control study with more than 1200 patients, it was seen that myomectomy during cesarean section is a safe procedure from point of view of blood loss, post-operative recovery and fever. In our case also, there was no need for massive blood transfusion, there was no febrile morbidity and postoperative recovery was otherwise uneventful. According to Akkurt et al long term outcomes for subsequent pregnancy in cesarean myomectomy are favorable. In this case, the earliest ultrasonography reported the fibroid to be fundal and intramural. Later done obstetric scans did not comment on any change on either the size or the location of the fibroid. In case the anterior low lying location was known prior, it may have helped in some preparation regarding the uterine incision in order to avoid a myomectomy. The decision of enucleation is made on the basis of tumor size, location, proximity to vascular areas and severity of symptoms. Large fundal intramural fibroids, intramural fibroids located near cornual region, isthmus region and seedling fibroids and fibroids in cornual region are best left untouched. Our patient had an obvious, easily accessible fibroid, which made the performance of myomectomy relatively easy. Although ultrasound is a gold standard, dynamic MRI can give vital information about vascular supply or myometrial involvement in patients with fibroid related post-partum bleeding. Rarely complications like pyomyoma may create diagnostic dilemma in postpartum period. They can manifest postpartum and rarely, even months later. None of these complications were noted in our patient. As data on long term outcomes in women undergoing cesarean myomectomy are lacking, the procedure should be undertaken very cautiously. Cesarean myomectomy is no more a rare procedure, but there is no unanimity of opinion on its safety. Prior to proceeding with cesarean section for any indication, it is advantageous to know the location of the fibroid. This case is presented to highlight that even if there was no preoperative plan, there may be an intraoperative need for a decision of cesarean myomectomy. Awoleke JO. Myomectomy during Caesarean Birth in Fibroid-Endemic, Low-Resource Settings. Obstet Gynecol Int. 2013 Nov; 2013:520834. Lee H, Norwitz ER, Shaw J. Contemporary Management of Fibroids in Pregnancy. Rev Obstet Gynecol. 2010 Winter; 3(1): 20–27. Bhatla N, Dash BB, Kriplani A, Agarwal N. Myomectomy during pregnancy: A feasible option. J Obstet Gynaecol Res 2009; 35(1):173–5. Lin JY, Lee WL, Wang PH, Lai MJ, Chang WH, Liu WM. Uterine artery occlusion and myomectomy for treatment of pregnant women with uterine leiomyomas who are undergoing cesarean section. J Obstet Gynaecol Res 2010; 36(2):284-90. Akkurt MO, Yavuz A, Eris Yalcin S, Akkurt I, Turan OT, Yalcin Y, et al. Can we consider cesarean myomectomy as a safe procedure without long-term outcome? J Matern Neonatal Med. 2017 Aug ; 30(15):1855–60. Torrance S, Muhn N, Ellis S, Rebello R, Ramanna R. Role of dynamic MRI in surgical decision-making for a postpartum woman with a prolapsed degenerating uterine leiomyoma. J Obstet Gynaecol Can. 2009 May; 31(5):446-51. Sirha R, Miskin A, Abdelmagied A. Postnatal pyomyoma: a diagnostic dilemma. BMJ Case Rep [Internet]; 2013: bcr2013201137. Sparić R, Kadija S, Stefanović A, Spremović Radjenović S,2, Likić Ladjević I, Popović Cesarean myomectomy in modern obstetrics: More light and fewer shadows. J Obstet Gynaecol Res. 2017 May; 43(5):798-804.